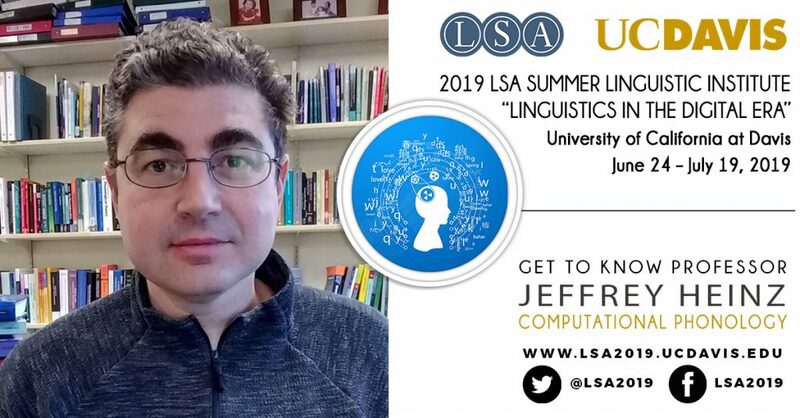 “Truth, not Tribalism.” Jeffrey Heinz (Stony Brook University) talks about the early days of his career that will inspire all the budding linguists out there. Find out what Professor Heinz has to say about the quarter vs semester system, what he describes as a neurotic bundle of joy, and his Computational Phonology course for the LSA Institute at UC Davis. After graduating, I spent two years in the Solomon Islands teaching secondary school level mathematics with the Peace Corps, and then a year in Japan teaching English, and a year in Los Angeles as a counselor for the music department at UCLA. Many more months cannot be accounted for with employment; I traveled a lot. I began graduate school in 2002 in Linguistics at UCLA, where I studied phonology, formal language theory, and learning theory. In retrospect, the years outside of university really helped prepare me for graduate school. They gave me a sense of independence, clarity of thought, and self-reliance I don’t think I would have had otherwise. When I first met Ed Stabler he told me he was interested in how computers learn language. I asked, “Don’t you think human children learn language differently than computers?” He said, “When I say ‘computer’, I mean something that computes, not the metal and plastic thing on your desk.” That brief exchange has informed my perspective ever since. I also learned a lot from Ed Keenan. In many ways, his work on conservativity was an incredible influence on my own work in phonology. Out of all the logical possibilities, what do we see in natural languages and why? That’s the kind of question I learned to ask at UCLA — and mathematical methods made it possible to ask and answer it very concretely. In 2007 I completed the PhD and began working as an assistant professor in the Linguistics and Cognitive Science department at the University of Delaware. I was very fortunate to collaborate with many wonderful individuals there. After ten years at UD, I joined the Linguistics department and the Institute for Advanced Computational Science at Stony Brook University. My goal at Stony Brook is to give subsequent generations of linguistic scholars the kind of computational and mathematical thinking that puts principles of language and language-learning at the forefront of linguistic theory, artificial intelligence, and machine learning. I first joined in 2005 when I presented research at the annual meeting in Oakland, California. I am teaching a course titled “Computational Phonology.” The basis for the course is a book I am preparing with many former students titled “Doing Computational Phonology” which will be published by Oxford University Press. The book studies the kinds of representations and computational power minimally needed to adequately describe phonological patterns. Representation and computational power play off each other. With some representations, some computations are cheap and others expensive. What principles tell us which trade-offs to make and why? Model-theoretic methods from mathematical logic provide a way to study this precisely. I am currently working on developing learning algorithms that learn grammars given as logical formulas. One desideratum is that the algorithms should work for different kinds of representations: string, trees, and graphs. Also, I continue to think a lot about mathematical characterizations of long-distance phonological processes. I like swimming and playing in the water a lot, but I don’t do enough of it. Well, there was a time I imagined myself becoming an actor or a performer. I did a lot of traditional theater in high school and improvisational theater in college. After I got married though I realized I didn’t want the instability that kind of life brings. And what do they say about acting? “If you can do anything else, you should do that instead.” And I can do something else. I can think about language mathematically and computationally. I’d like for others to learn to do this too. I love the California sunshine and the diversity of people and landscapes. Davis is in the middle of it all! Ice cream AND cake. I grew up with cats but now we have a dog. Its name is Chaco and it’s a miniature poodle. It’s a neurotic bundle of joy. I’d like a 12 week system. 10 week quarters are too short but 14 week semesters often seem to drag a bit somewhere. Truth, not tribalism. And think carefully about an academic career: there are many long days, weeks and months with little in the way of reward, especially early in one’s career. So it helps to value personal satisfaction and freedom instead of the kinds of things our culture projects as success like wealth, power and fame. Learn more about Professor Heinz in his website here.